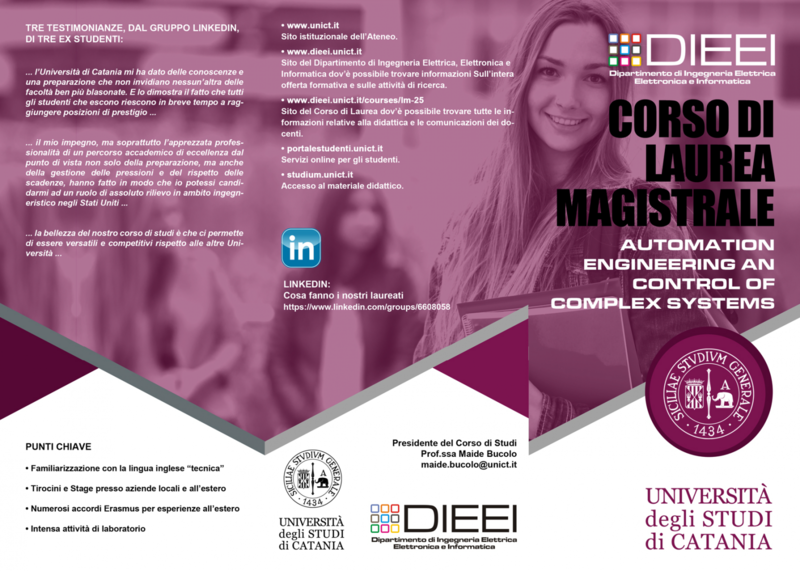 The Master Degree Course In Automation Engineering and Control of Complex Systems aims to provide students a deep knowledge of the fundamentals of technical as well as scientific aspects of the disciplines which characterise the field of Automation Engineering, without discarding affine and integrative subjects. The Course is focussed at forming a high knowledge in students, enabling them to easily follow technological innovation in the industries as well as in public and/or private research institutes. The Course In Automation Engineering and Control of Complex Systems will be able to provide both a suitable design ability devoted to the development of traditional techniques and a capability to face with novel problems in emergent scenarios. The Automation Engineer will find an easily working configuration in Enterprises dealing with automated plant and Robotic assisted production sites, as well as in those industries which develop highly technological products which integrate software components, measurement, transmission and actuation systems. Primary goals of the Course are to provide a highly flexible knowledge which allow to easily adapt among multiple application working sectors where Automation is involved as a result of the technological development and the new working conditions. Analysis and Design capabilities, based on the use of the modern tools are the basic features provided by the Course.